a. The Secretary has overall responsibility for the development of viable and executable contingency plans for COOP. b. The Assistant Secretary for Administration has the lead in COOP development and planning for the Department. c. Each Headquarters Program Office COOP Coordinator is responsible for development and maintenance of a current COOP Implementation Plan for his/her office that identifies its essential functions and the individuals needed to support them, consistent with the guidance provided by this handbook and FPC 65.
d. Regional Directors are responsible for development of a Regional Office COOP plan and oversight of the development of all Field Office COOP plans within their jurisdiction. e. Field Office Directors are responsible for development of Field Office COOP plans. f. Regional and Field Office Program Directors are responsible for providing all required information and support to their Regional Directors and Field Office Directors in all phases of COOP plan development, test, training, and exercise, and plan implementation. They must ensure appropriate coordination with the COOP Coordinators in their respective Headquarters program office. g. The Secretary, Regional Directors, and Field Office Directors are responsible for executing their respective COOP plans. h. The Directors, Administrative Service Centers (ASC) and Directors, Administrative Resource Divisions (ARD), are responsible for providing direct support to the Regional and Field Office COOP Coordinators in developing those portions of the COOP plans falling within Administration’s area of responsibility. These include: space, furniture, office supplies and equipment, building security, telecommunications, data systems, information technology and connectivity, procurement, transportation, lodging, and general administrative support. i. All Regional Directors will develop a COOP Multi-Year Strategy and Program Management Plan for their Region and Field Offices that includes a program budget to support a viable COOP capability for their region. This plan should be coordinated with the Director of their respective Administrative Service Center and the Assistant Deputy Secretary for Field Policy Management, Headquarters HUD. j. All HUD organizations, both in the Headquarters and the field, will participate in interagency COOP exercises to ensure effective interagency coordination and mutual support. k. Administration and Information Technology (IT) staffs assigned to Field Offices are responsible for assisting Field Office Directors and Regional Office COOP Coordinators in identifying and addressing all Administration and IT resources required for developing a viable Field Office COOP plan. 1. Serve as the lead in planning the HUD COOP program. 2. Develop and maintain the HUD Headquarters COOP Plan. 3. Maintain copies of Headquarters program office COOP Implementation Plans. 4. Coordinate the annual review/update of COOP plans. 5. Coordinate the development of COOP plans and procedures that will enable designated Regional Offices to temporarily assume HUD HQ duties. 6. Provide technical assistance, as necessary, to the ASCs, local Administration staff, and Regional and Field Office COOP Coordinators in developing their COOP plans. 7. Maintain copies of Regional Office and Field Office COOP plans. 8. Develop a HUD COOP Test, Training and Exercise (TT&E) program. 9. Develop COOP notification procedures for disseminating instructions regarding COOP. 10. Schedule and conduct periodic training and exercises related to the execution of HUD COOP plans. 11. 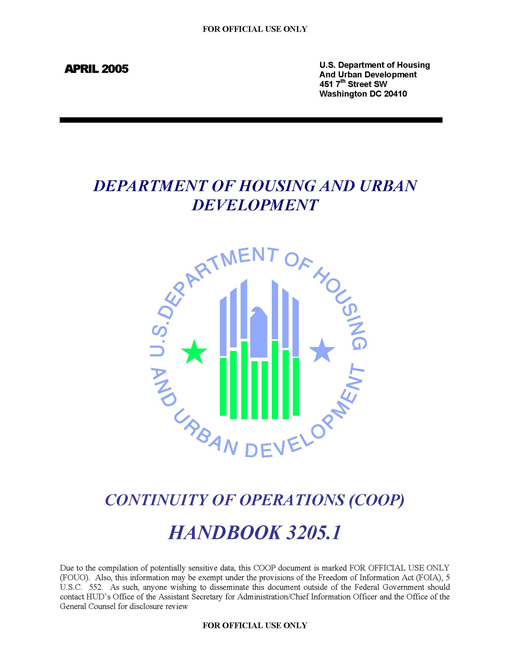 Conduct periodic assessments of HUD COOP capabilities to include exercises, emergency notifications, and evaluations. 12. Coordinate HUD COOP security, safety, and health requirements. 13. Provide guidance on the management of vital HUD records. 14. Coordinate the development of plans and schedules for the orderly transition of all HUD essential functions, personnel, equipment, and vital records from an emergency Relocation Site (ERS) to a new or restored HUD HQ facility. 15. Develop a COOP Multi-Year Strategy and Program Management Plan that includes a program budget to support a viable COOP capability. 16. Participate in interagency COOP exercises to ensure effective interagency coordination and mutual support. 17. Develop and maintain a HUD Remedial Action Program (ERAP). 18. Coordinate intra-agency COOP efforts and initiatives in accordance with directives. • Notify the FEMA Operations Center (FOC) and other appropriate agencies upon any implementation of COOP plans. • Provide updates on COOP status to the FOC as required or if the HUD’s COOP status changes. 3-3 Planning Requirements: A viable COOP capability consists, at a minimum, of the following elements: a. Must be capable of implementation both with and without warning; b. Must be operational within a minimal acceptable period of disruption for essential functions, but in all cases within 12 hours of COOP activation; c. Must be capable of maintaining sustained operations until normal business activities can be reconstituted, which may be up to 30 days; d Must include regularly scheduled testing, training, and exercising of HUD’s personnel, equipment, systems, processes, and procedures used to support HUD’s essential functions during a COOP event; e. Must provide for a regular risk analysis of current alternate operating facility(ies); f. Must locate alternate operating facilities in areas where the ability to initiate, maintain, and terminate continuity operations is maximized; g. Should consider locating alternate operating facilities in areas where power, telecommunications, and Internet grids would be distinct from those of the primary facilities; h. Should take maximum advantage of existing HUD Regional and Field Office infrastructures and give consideration to other options, such as telecommuting locations, work-at-home, virtual offices, and joint or shared facilities; i. Must consider the distance of alternate operating facilities from the primary facility and from the threat of any other facilities/locations (e.g., nuclear power plants or areas subject to frequent natural disasters); and j. Must include the development, maintenance, and annual review of HUD’s COOP capabilities using a multi-year strategy and program management plan. The multi-year strategy and program management plan will outline the process HUD offices will follow to: (1) Designate and review essential functions and resources, (2) Define short and long-term COOP goals and objectives, (3) Forecast COOP budgetary requirements, (4) Identify COOP program issues, concerns, potential obstacles, and the strategy for addressing these, as appropriate. (5) Establish a schedule and milestones for COOP planning, training, and exercise. 8. Access to HUD critical systems.